I bought a 1999 Porsche Boxster (986) around 2 years ago and it didn't start. 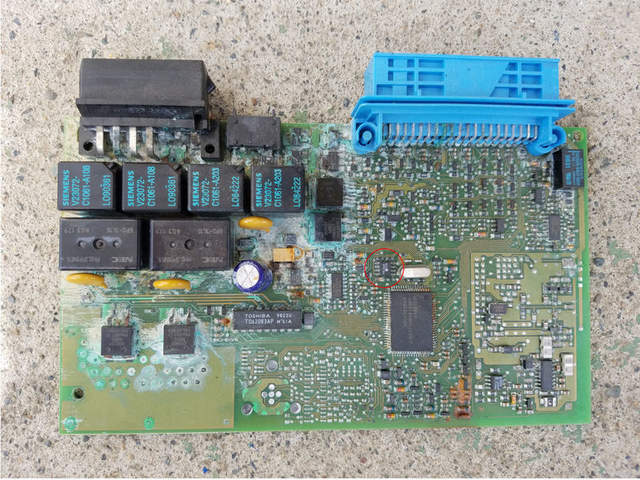 I found that the Immobilizers was wet and corroded so I found a used Immobilizers on eBay and after identifying the chip that stored the memory I copy pasted the original code from my Boxster into the used Immobilizers. Now my car runs and drives. The fix costed me around $200 USD. I want to know who has run into a problem where water got into the cabin and then the car didn't start possibly due to the Immobilizers being done for. I want to see if we can figure out how this system works and possibly get a few more Boxsters on the road. Last edited by JakeSFHunter; 09-13-2018 at 11:22 PM. I have a 99 base as well. Last fall my drain up front on the drivers side fell through. Basically soaked my immobilizes in a pot of water for 2 months while in storage, and I didn’t know it. After removing it, cleaning it up as much as I could, the car starts, but I lost features. My courtesy lights don’t work, my keyless entry didn’t either. That’s all I’ve noticed so far. There was a guy who was repairing and waterproofing them, but I’ve yet to commit. If you do some searching, you will find that plenty of people have dealt with the problem and it comes up regularly. There are some professionals that rebuild or reprogram the units. 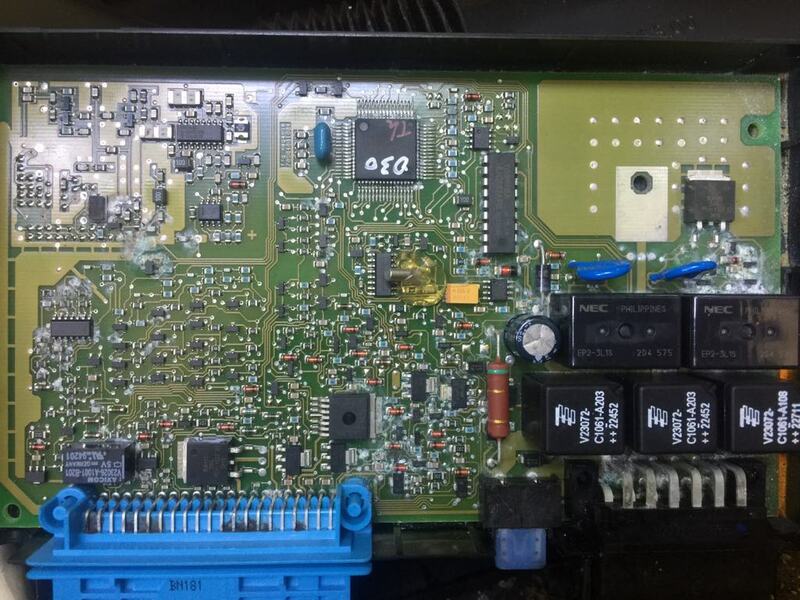 A few people have the experience and tools to swap or reprogram the eeprom. Many have replaced the transponder, central locking unit, and DME with a matching set from another car. In my most recent water intrusion event, caused by a clogged drain to the left of the engine, I was able to clean and dry the module before any permanent damage was done. Getting all the water out of the carpet padding was the most time consuming part. Here's the worst one I've had. This car sat for about 6 months, wet. Once corrosion gets into the relays, you might as well replace the unit. Mine definitely didn’t / doesn’t look that bad lol, thankfully! ... Would you be interested in dealing with mine? I’ll be by the car later today and can post a pic of mine. I’d like to just bypass it, but haven’t researched it yet. I probably can't do much for yours, but I highly recommend forum member 'Qmulus'. I'm sending you a PM with his contact info. This is how bad my immobilizer was. It didn't work at all and the chip circled in red was the chip I tapped into and copy its memory onto the other used immobilizer's memory. The only problem I have now is the security system doesn't fully engage (maybe because the pigtail is partially destroyed). When locking the car the the alarm sounds twice, and the red light flashes twice every 10 seconds. Coincidentally my remote stopped working after a few weeks, light flashes but don't send a signal. Regarding the immobilizer the chip can be soldered over to a different immobilizer or I can explain how I reprogrammed it, but there are professionals here (wish I knew earlier) who can do it better than me. ... Regarding the immobilizer the chip can be soldered over to a different immobilizer or I can explain how I reprogrammed it, but there are professionals here (wish I knew earlier) who can do it better than me. You did great and the $200 you paid is less than the pros usually charge. As for your other security system issues, you could start another thread specifically about them, but do a good search first. I know that the 2 beeps and flashing light has come up a few times too. 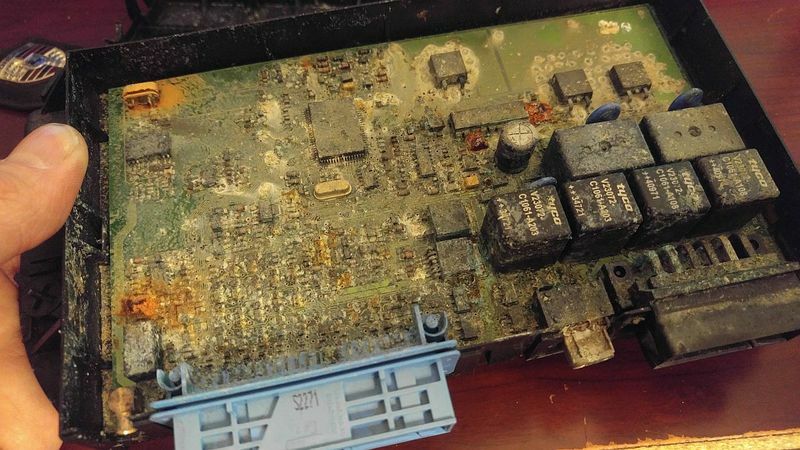 I have not had to deal with that yet, but I remember reading about the ground for the radio causing some alarm problems after installation of an aftermarket system. Also make sure all the connections and grounds are clean for the immobilizer box. I have a harness I can scavenge for parts if yours has a corroded connector. I sent Qmulus a msg thru this board but have yet to hear back. Would it be possible for you to relay my contact info to him or PM me his email, FB, text or other way of getting a hold of him? Just heard back from Qmulus, all set on this end.